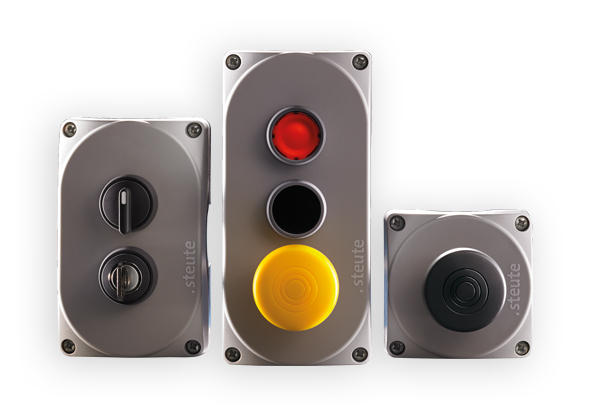 Switching with pushbuttons and control switches is a simple way of operating a device or a technical installation. The user can switch a certain function on or off with one hand control. The color, inscription and / or function-describing text usually shows the operation of the push button or switch. 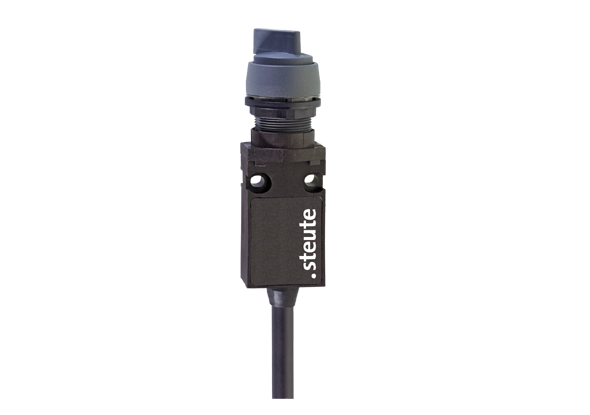 Steute is a developer and manufacturer of high-quality switchgear, sensors and control units for industrial automation, medical equipment and building automation. Push buttons and control switches come in different variants. Wireless push buttons and control switches and switches with cable. The pushbuttons and control switches are equipped with different actuators; rotary knobs, pushbuttons, key switches, creep switches, toggle switches, enclosures with single or multiple actuators and ATEX pushbuttons and control switches. The ES 14 RT push button switch is equipped with a pressure switch. The switch has a glass-fiber reinforced, impact-resistant thermoplastic (plastic) housing with a degree of protection of IP65. The push button switch is extra insulated and is self-extinguishing UL 94-V0, resistant to temperatures of -20 °C and +75 °C. The push button switch is supplied with 1 meter cable as standard. 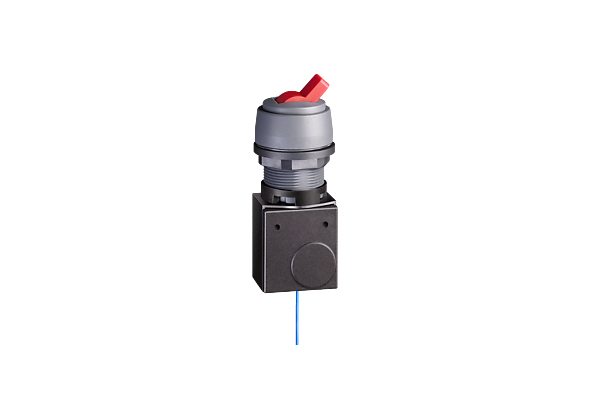 The control switch ES 14 RTM is equipped with a push button with diaphragm actuator. The plastic housing (fiberglass-reinforced, impact-resistant thermoplastic / self-extinguishing) with a degree of sealing of IP65 is resistant to temperatures of -20 ° C and +75 ° C. The push button switch is supplied with 1 meter cable as standard. Mounting dimensions according to EN 50047. 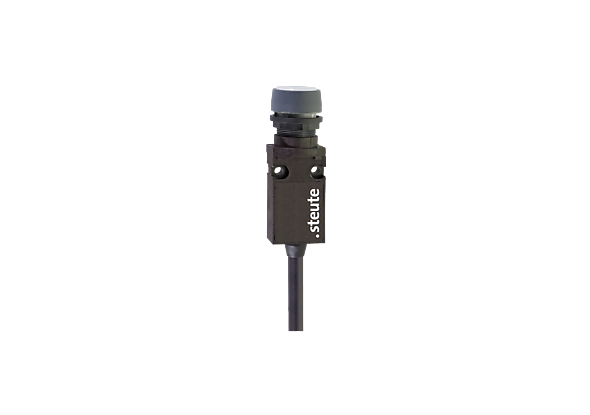 TheES 14 RSSA control switch from steute is equipped with a key switch / safety cylinder lock. The switch is extra insulated and the glass-fiber reinforced, impact-resistant thermoplastic housing is resistant to temperatures of -20 ° C and +75 ° C with an IP65 degree of protection in accordance with IEC / EN 60529. The control switch with key switch is supplied as standard with 1 meter cable. The control switch ES 14 RWA is equipped with a selector switch. 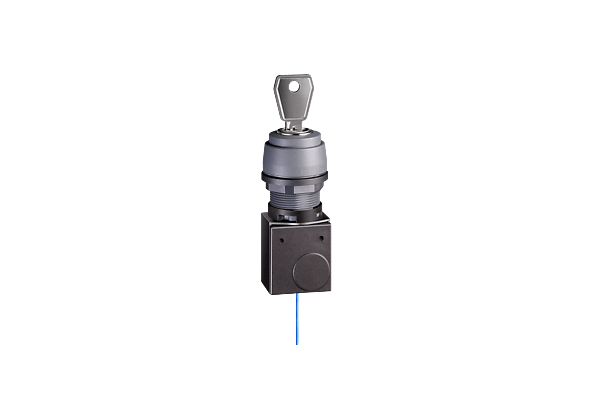 The selector switch has a fiberglass reinforced, impact-resistant thermoplastic housing and is additionally insulated with a degree of protection of IP65 in accordance with IEC / EN 60529. 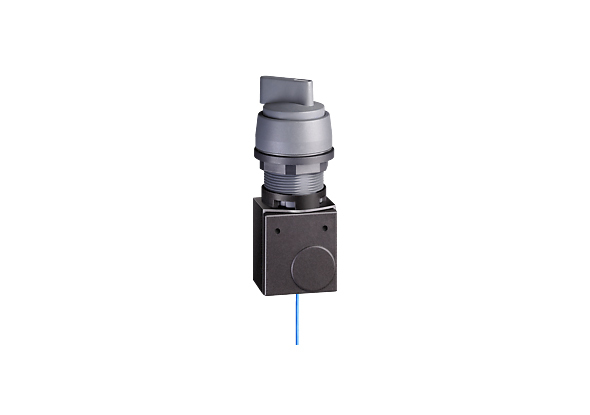 The control switch has a mounting diameter of 22.5 mm. The selector switch can be used in ambient temperatures from -20 ° C to +75 ° C. The ES 14 RSTA is equipped with a rotary knob. 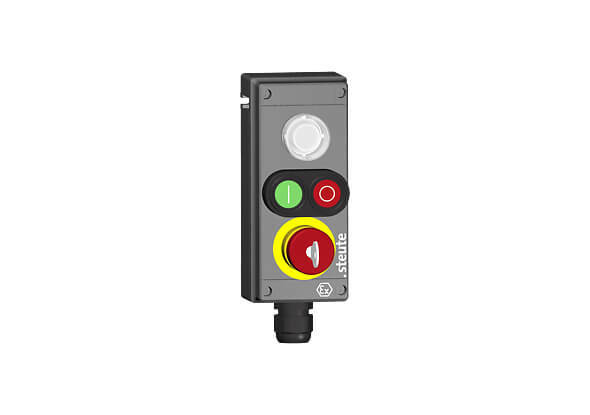 The control switch ES 14 RUV is equipped with an emergency stop button with pressure point to protect unwanted operation. As soon as the emergency stop button is activated, the safety switch is activated. The emergency stop button can be unlocked by turning the emergency stop to the right. 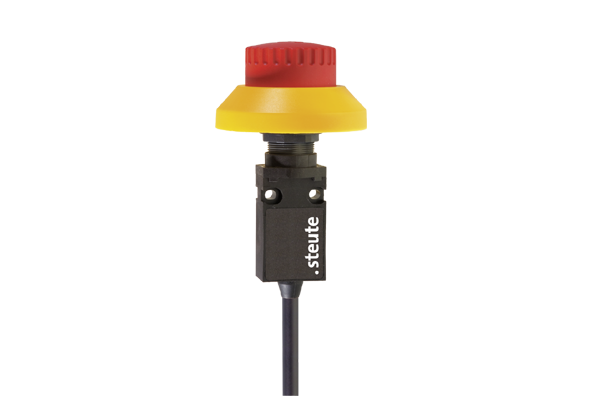 The emergency stop button switch is extra insulated and has a fiberglass reinforced, impact-resistant thermoplastic housing with a sealing degree of IP65 and is resistant to temperatures of -20 ° C and +75 ° C.
For explosive environments, steute has 'extreme' switches. This extreme command switch / control box BF80 3 LM / DDT / PZSTNA can be used in applications with explosion zone 1 and 21. The switch has three actuators: LED indicator lamp LM, double push button DDT and emergency button with one break / 1 closing contact per button . There are several versions available with two or three controls. In addition to wired push buttons and control switches, there are wireless variants. The wireless switches operate according to sWave868, sWave915 and EnOcean protocols and operate on the basis of kinetic energy. The operating switches are designed with one or more switching elements and can be made in block form. 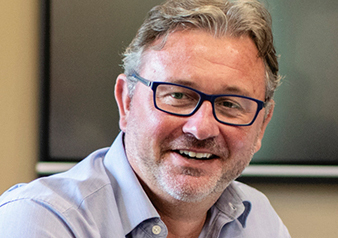 Read more about wireless switching. 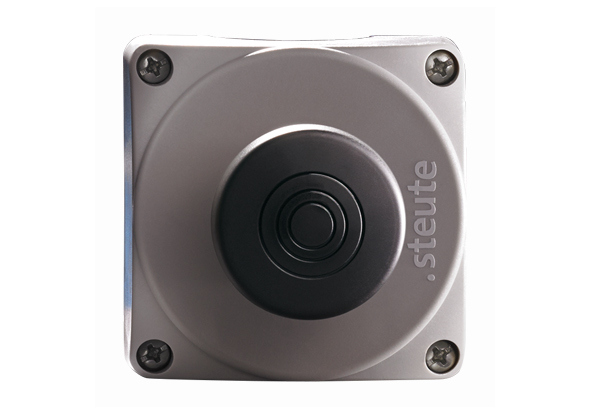 The wireless control switches with turn knob actuator from steute are self-sufficient and operate on the basis of kinetic energy. The rotary switches operate according to the sWave868 and sWave915 protocols. The RF BF 74 RSTA has a range of 450m outside and 40m inside. 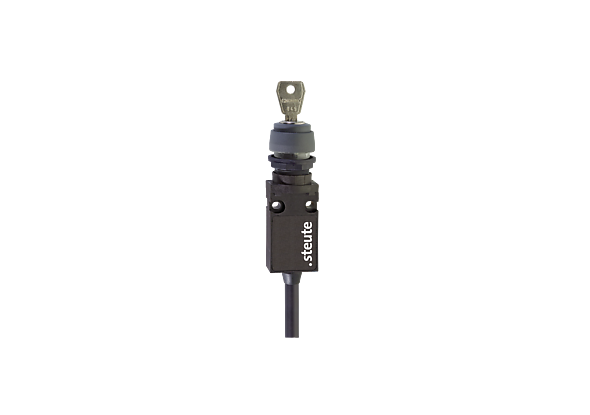 The RF BF 95 RSTA ULR variant has an outside range of 700m and within 50m. The RF BF 94 RSTA variant is executed in block form. The wireless switches can be used in environments with temperatures between -20 ° C and +65 ° C.
The actuators with push button actuator are self-sufficient and operate according to the sWave868, sWave915 and EnOcean protocols. The push button switches have a sealing degree of IP65 / IP67. The push button switches have a range of 200-450m outside and 20-40 m inside. The wireless switch can be used in environments with temperatures between -20 ° C and +65 ° C. The rotary switches are made of fiberglass-reinforced, impact-resistant thermoplastic. The wireless pressure switch RF 95 RTM EN868 is equipped with a diaphragm and can be used in Ex zones 1 and 21. 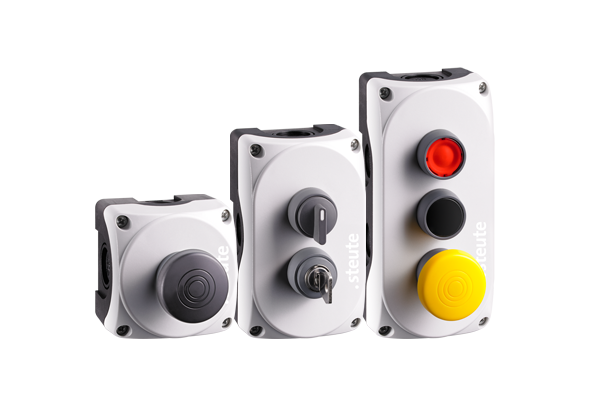 The RK series control switches from steute are wireless toggle switches and are self-sufficient. The toggle switch uses the sWave868 and sWave915 protocols. The control switch with toggle switch has a degree of sealing of IP65. The wireless toggle switches have a sealing degree of IP65 with a range of 450m outside and 40m inside. The RSSA series wireless control switches are equipped with a key switch. The wireless switches with control key are self-sufficient and have a range of up to 450m outside and 40m inside. The key switches have a sealing degree of IP65 / IP67 and operate according to sWave868, sWave915 and EnOcean protocols. The RF BF 72 and 94 are executed in block form. 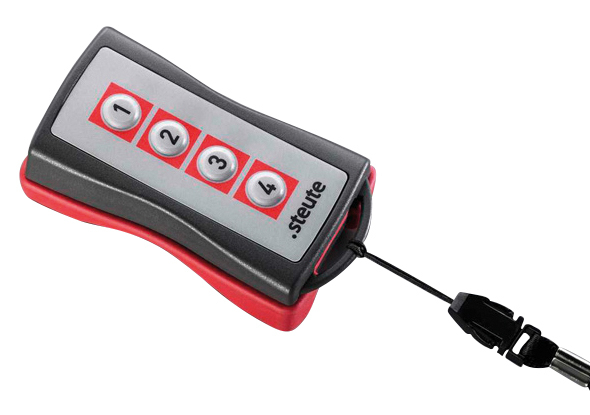 The RF HB wireless remote controls from steute operate according to the sWafe915, sWave868 and sWave® 2.4 Ghz protocols. The wireless remote control is equipped with 4 push buttons and works on 3x AAA 1.5V batteries. The remote control has a sealing degree of IP54. The circumferential fabric seal serves as shock protection. Equipped with an antenna, the wireless remote control can switch 10m away. The remote control has a lanyard attachment option. Read more about wireless manual control switches.